There are three cemeteries in the Town of Lewis: Lewis (Center) Cemetery, Deerhead Cemetery	and Roscoe Cemetery. The information herein is from the Deerhead Cemetery documented in	2006 and 2007. Deerhead Cemetery is sometimes referred to as Crowningshield Cemetery, Church Cemetery or	(according to Catherine Sweatt) Fairview Cemetery. It is a small cemetery that serves the people	living in the hamlet of Deerhead in north Lewis. It is located on the south side of the of Hale Hill	Lane, which ends as a dirt road, about 0.7 miles from US Route 9 north of Lewis. 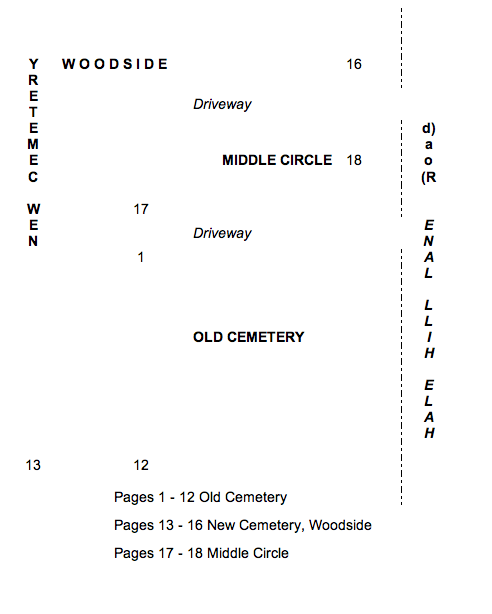 Because of my interest in genealogy, I first "mapped" the Deerhead Cemetery in 1977, starting	with a list of names as researched by Mr. Bill Denton, Sr. in 1940, the list at that time in possession of Mr. Albert Hayward of Essex, NY. In June of 1977 I reviewed, corrected and updated Mr. Denton's list using the information found on the monuments and markers. This information is now updated by me thirty years later. This was done by taking the original information, inputting it into the computer, then comparing the typed information with what is presently found on the monuments and markers. Corrections have been made and new information added at this time. It might be noted that the information on the monuments may not be correct, but is listed as found by this writer. The layout of the Deerhead Cemetery divides it into Blocks for ease of locating monuments and markers. Page numbers found in each Block designate the start and end of each Block as the information is recorded row by row. Note: Page numbers may not show up on rootsweb.com. As the rows in the middle of the old cemetery area are not straight, it was difficult to list the stones in this methodical fashion. A final alphabetical index is included for reference and to assist in locating individual monuments and markers. Maiden names have also been listed in the Index to assist a researcher in locating a family name. From this information it is easy to learn what families lived in this hamlet over the years. It is a	charming little cemetery, yet a visitor does not feel warmly welcomed by the signs posted at both	entrances that say, "Deerhead Cemetery Closed, Town Board of Lewis." Though I have proofread the information herein, I apologize for any typographical errors that I	might have made.